One of the most important parts of an early understanding of the risks attached to an infectious disease outbreak is knowing where it is. Which country? What part of the country? How remote is its location? How easy is it to access for the locals and for any help that may be coming? Could its location have played a role in exposure to an infected vector or reservoir? Are there hospitals or health centres? Maps are key to understanding these questions. 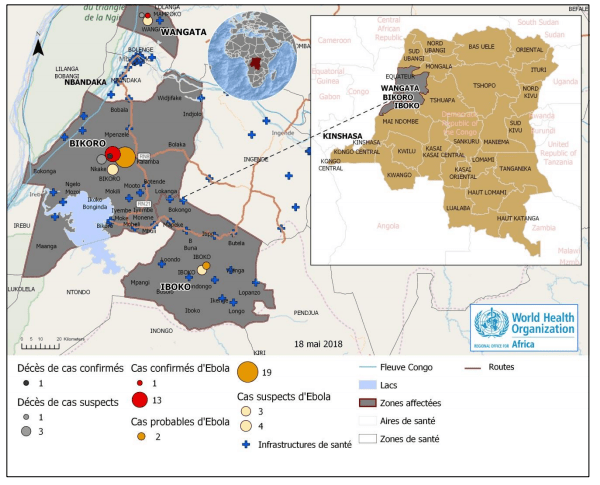 This latest outbreak of Ebola in the Democratic Republic of the Congo (DRC) has been interesting in terms of map evolution. 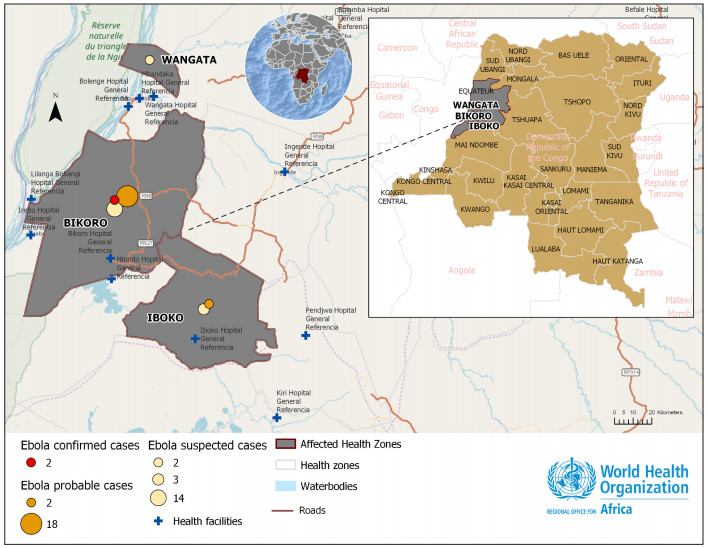 Ebola virus disease (EVD) situation reports (SitReps) and disease outbreak news (DONs) are produced by the World Health Organization (WHO). Many have maps. Its been interesting to watch maps appear on the ReliefWeb website  from a range of organisations including Medicins Sans Frontieres geographic information system (GIS) Unit and World Food Program (WFP) Logistics Cluster maps produced by WFP GIS (these can be freely used with acknowledgement of the source). There are various boundaries marked on all the maps – and it can get pretty confusing especially if outlets refer to an HZ but mean a settlement or vice versa. If you’ve been following any of my content you’ll certainly have seen the maps change regularly over the past 2 weeks. Apologies if that has inconvenienced anyone. A new version will be posted in a blog soon. These maps have shown the greatest evolution over time – especially the SitReps, adding lots of public-relevant detail. Interestingly, some of these maps show the HZs crossing over the Congo River in the west – presumably including the many islands in the river. Other maps show the HZs ending at the nearest bank. It would be interesting to know which is correct since people live there. Some maps have the Wangata HZ in a different area than others. My maps end at the riverbank for now. Map 1. EVD External SitRep 1. 11MAY2018. http://apps.who.int/iris/bitstream/handle/10665/272509/SITREP-EVD-DRC-20180511.pdf. I think this was the first map of the outbreak marking the major areas of initial case origins in terms of health facilities. Origins of the first infection and spread etc remain undescribed. The next generation maps added more detail including the three HZs that sit over the city of Mbandanka. As noted below, this depiction differs from that by MSF but is the same as the maps from the WFP except those don’t extend across the Congo River to include the islands. Most of these have been updated or prepared since the announcement of this latest EVD outbreak and have huge amounts of detail. This MSF map causes confusion by including HZs, Health Districts and Health Areas. It also outlines the Mbandaka HZ sitting top of the city of the same name (makes sense! 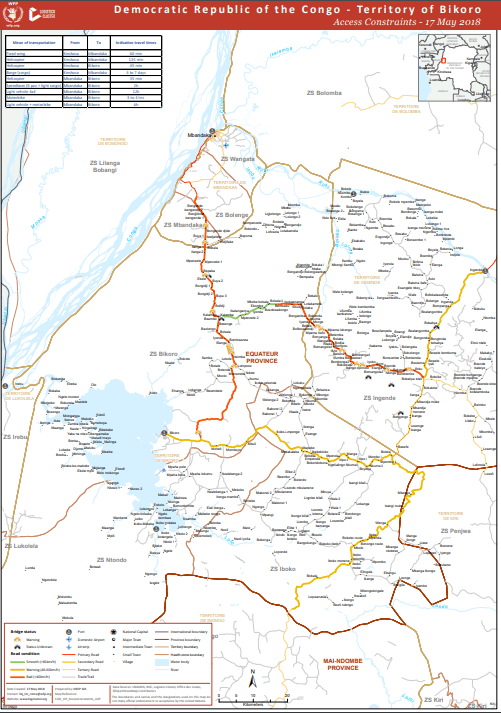 ), whereas the WHO and WFP maps place the Mbandaka HZ underneath the Wangata and Bolenge HZs. The shape of these 3 HZs also differs between maps. And the size of the Bikoro HZ is also smaller than in the WHO maps. 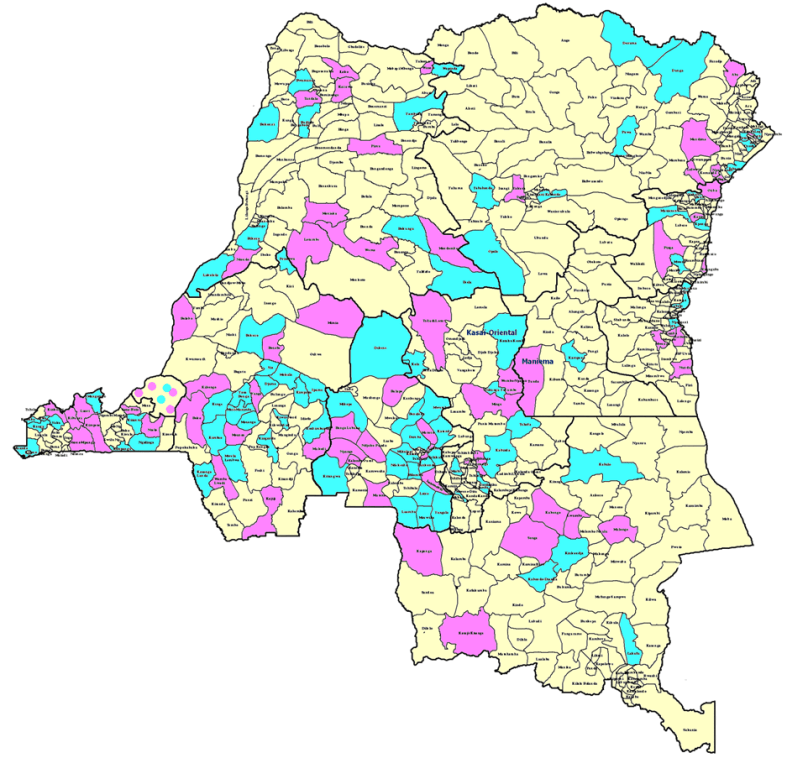 So when a case is announced in “Wangata” for example – there is quite a bit of interpretation to be had depending one the map in question. 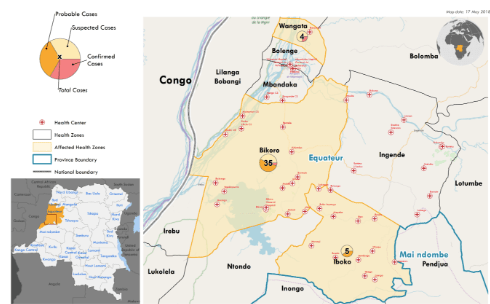 This map lays out cases and HZs using the same format as the WFP map, Map 10, below. Map 8. Équateur province and surrounds. 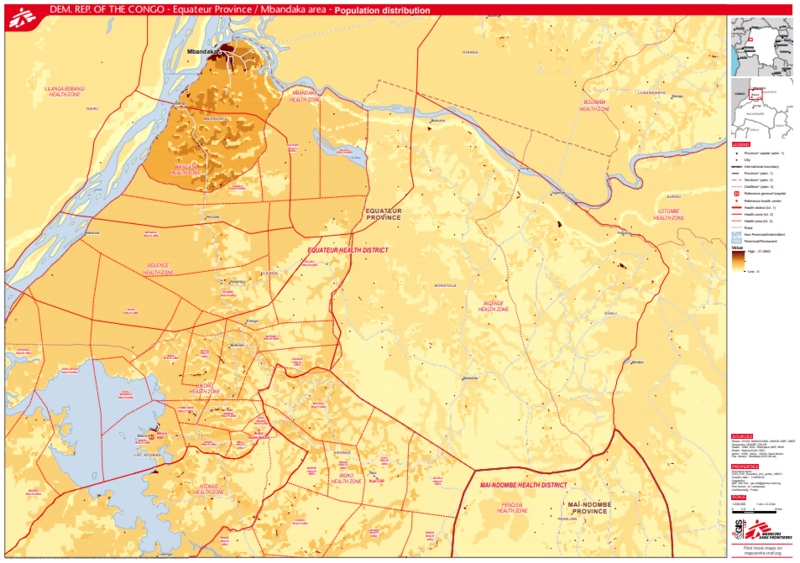 MSF GIS unit map. https://reliefweb.int/sites/reliefweb.int/files/resources/COD_POP_Equateur_A1L_public_180511v2.pdf. 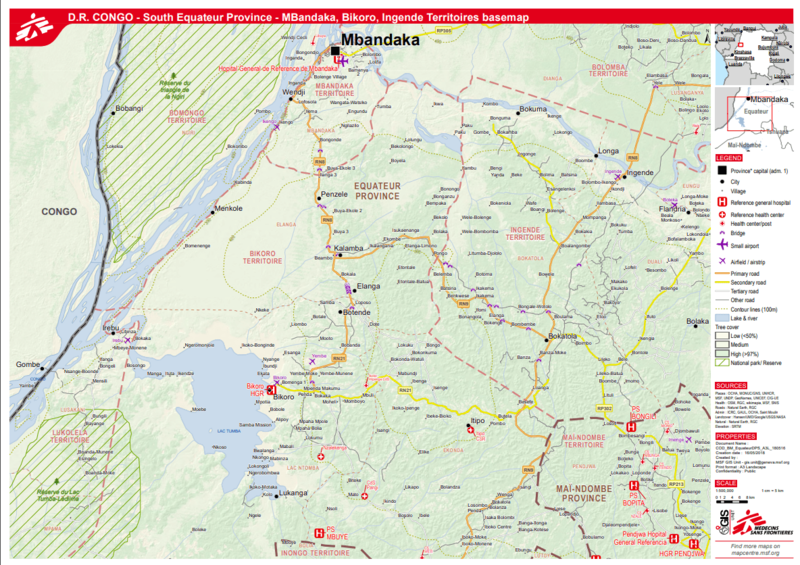 This MSF map includes the river in the HZs on the western border, and has the same same HZ order of the Mbandaka HZ trio (Bolenge, Wangata, Mbandaka) as does Map 6. Map 9. 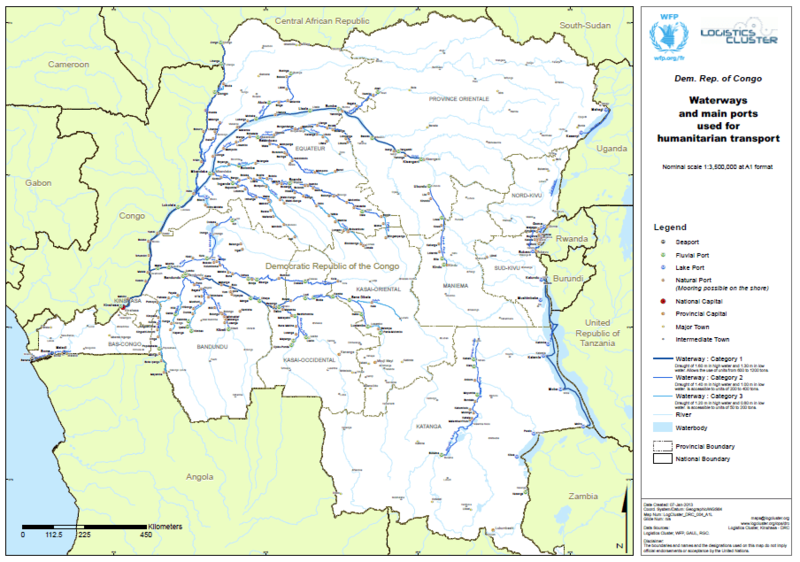 DRC Waterways and ports. WFP Logistics cluster map. This is a great map to show waterway connectivity. While travel my land is made difficult by the rough terrain, passage on the water could be a much more reasonable option. Map 10. Bikoro to Mbanaka. WFP Logistics Cluster map. 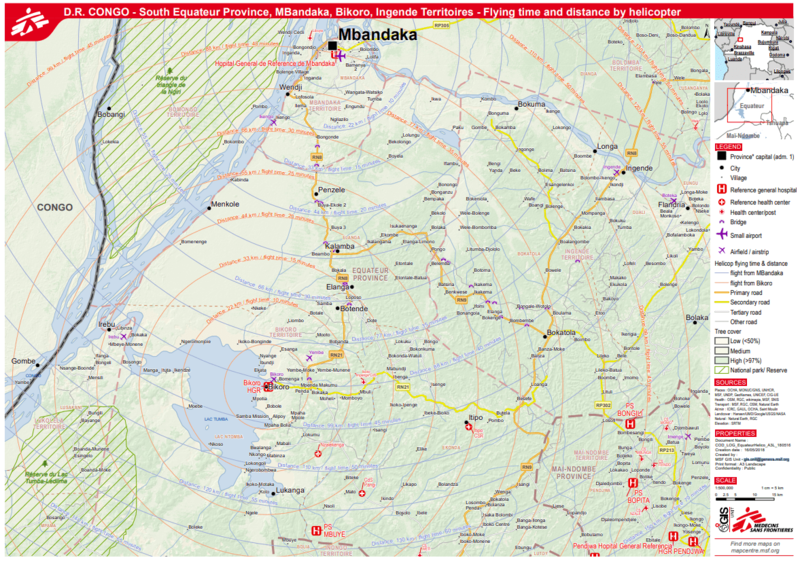 This WFP map shows the Wangata HZ over the central city of Mbandaka but it doesn’t extend over the river. The Bikoro HZ is about the same size and shape as that used by the WHO maps but the Mbandaka trio differ in shape. This MSF map is a great one for gauging travel times in the air highlighting health centres and territories. This map may just explain all the consfuuson above. But maps are really important, as some of the exampel above might prove. It would be great if MSF and WHO coudl get theirs on the same page. UPDATE: Ed Yong has since posted a much more thorough investigation of this subject – coincidentally – in The Atlantic at Most Maps of the New Ebola Outbreak Are Wrong. Very glad I wasn’t seeing things. 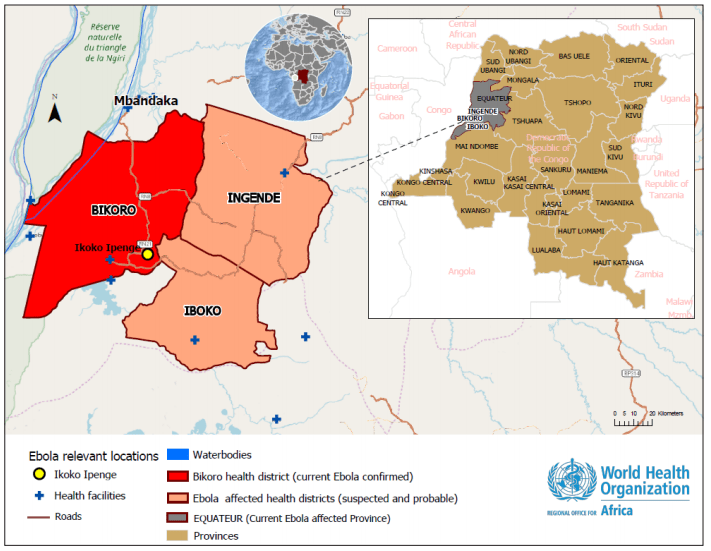 EVD External Situation Report 1. 11MAY2018. What is a Health Zone? South Equateur flight trimes. MSF GIS Unit map. Bikoro. GFP Logistics Cluster map. Equateur province and surrounds. MSF GIS unit map. Equateur Province and HZs. MSF GIS Map Unit. DRC Waterways abd ports. WFP Logistics cluster map. 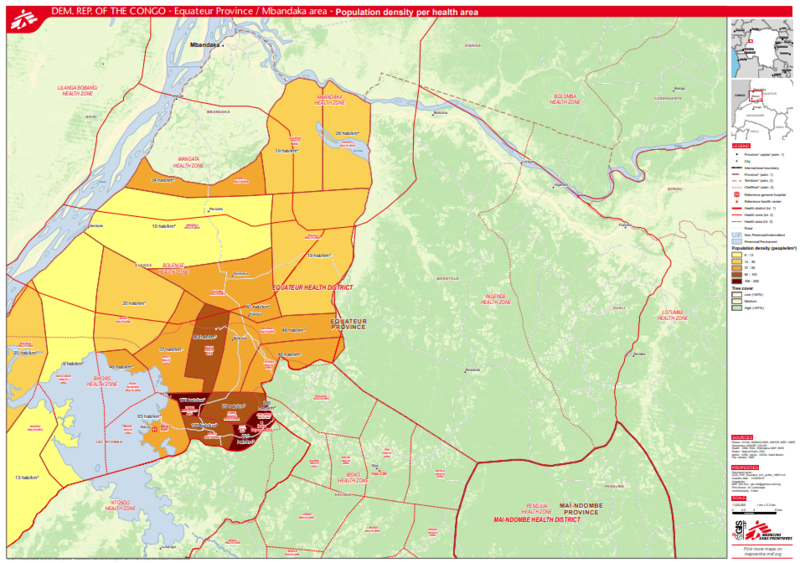 DRC Health Areas around Bikoro – MSF GIS Unit map. DRC Territories but not HZs. MSF GIS Unit map. Next → Next post: What’s new Influ2day…? The challenge is that the available datasets are not complete, are subject to restrictions on the use by commercial organisations and cannot be used without attribution meaning that the OpenStreetMap community cannot update or improve the map. One of the main providers of humanitarian GIS data has a weird projection of the data such that natural boundaries (rivers, hills, etc) are shifted from known locations and this dataset appears to be used by quite a few healthcare organisations (WHO and others). If the data that Ed Yong’s contributor references is made available to OSM, I’m sure that there are enough willing volunteers to ensure that the data is fixed and useful for all. The HOTOSM community has been mapping settlements and households in Mbandaka as part of a response to the Ebola outbreak and lots of additional detail has been added in the past week or so. This won’t change HZ assignments though will it? The data has a strange projection which means that when re-projected onto other datasets, the boundaries do not align to known structures (rivers etc). This is certainly not helping matters. Nice article on how to merge all the information available to get a complete picture of the situation. Unfortunately, this is a known issue with no clear solution by now, as organizations usually don’t use common base maps and/or don’t provide their raw data and only PDF files. If it helps, there are some datasets regarding Ebola (https://data.humdata.org/search?q=ebola&sort=metadata_modified+desc#dataset-filter-start) and Health (https://data.humdata.org/search?tags=health&q=&ext_page_size=25) in the HDX platform. 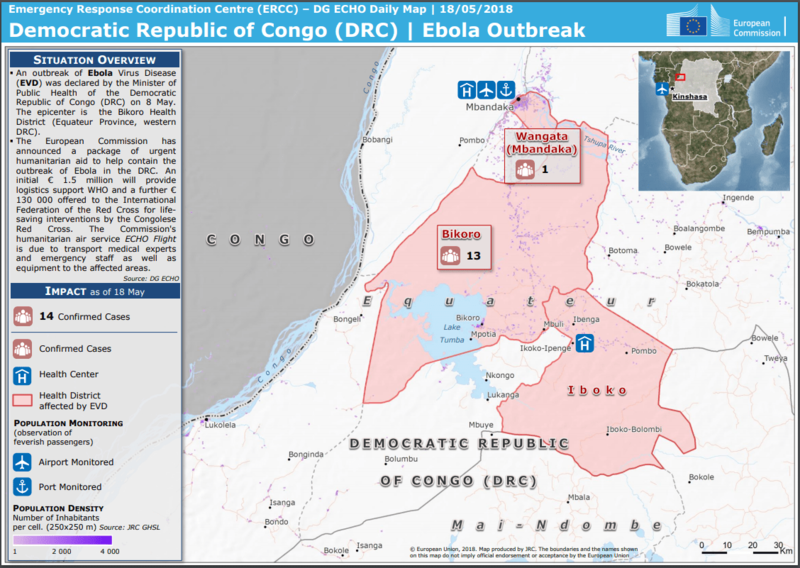 Additionally, in Reliefweb, you can find several maps in PDF format regarding Health (https://reliefweb.int/maps?theme=4595&format=12#content) and Ebola (https://reliefweb.int/maps?theme=4595&format=12&search=ebola#content). From those links, you can filter by primary country. Hope this information helps anyone. Relief web maps are sort of featured in the post above.